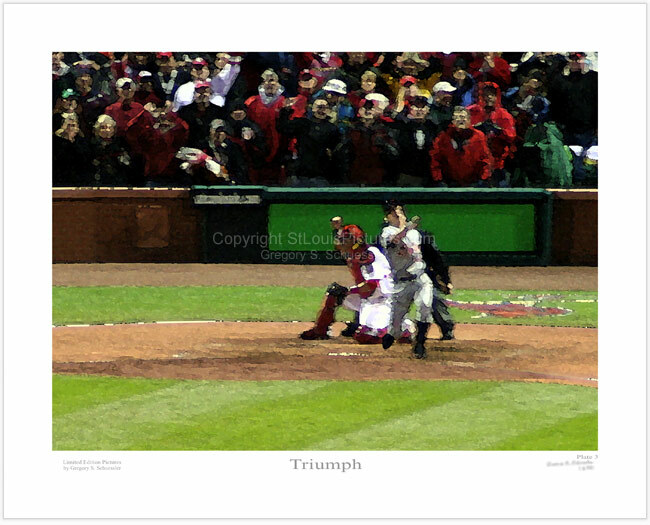 In this picture, St. Louis Cardinals catcher Yadier Molina pumps his fist in triumph, not even a second after the final strikeout of Brandon Inge of the Detroit Tigers, to win the 2006 World Series by a score of 4-2 on October 27, 2006. This picture is part of a four plate series. Plates 1 thru 3 show action from various areas of the full version depicted in plate 4. View plate 1, plate 2 and plate 4. StLouisPictures.com™ is not affiliated with Cardinals Care; however, a portion of the proceeds from the sale of this picture will be donated to Cardinals Care. Cardinals Care is the St. Louis Cardinals baseball team's community foundation which builds ballfields and supports agencies to help kids in health, education, mentoring and the arts. This picture is not available for purchase at this time. Contact me if you are interested in licensing this picture. Please note that the printed pictures do not have the copyright watermark shown in the center of the picture. My pictures do not come with frames due to the weight in shipping, however you can view my framing recommendations.